Coined by New Zealand educator Marie Clay, concepts about print (CAP) refers to what emergent readers need to understand about how printed language works and how it represents language. Successful beginning readers develop concepts about print at an early age, building on emergent literacy that starts before formal schooling. Print carries a message. Even when a child "play reads" text using pictures and memory, the child demonstrates an understanding of this concept, even if she cannot read the words, or reads them backwards or front to back. Books are organized, with a cover, title, and author, and reading in English flows in a particular and consistent direction, left to right and top to bottom. When young students successfully point to or otherwise track the print as someone reads aloud, they demonstrate their understanding of orientation and directionality. Printed language consists of letters, words, and sentences. The emergent reader gradually learns to distinguish between these forms, learns the concepts of "beginning" and "end, " and understands punctuation that marks text (e.g., period, comma, and question mark). Recognition of matching or upper- and lower-case letters, as well as some common spelling sequences, are slightly more complex concepts of print mastered by more experienced beginning readers. Concepts about print can be taught using shared reading of Big Books, enlarged charts and poems, or other kinds of engaging texts. It can also be taught through interactive writing, language experience dictations, or exploring print in the classroom environment. Many teachers use Clay's Concepts About Print assessment tool in late kindergarten or beginning first grade to assess students' concepts about print. Used by effective readers to figure out unfamiliar words and to make meaning, cuing strategies include knowledge of syntax, semantics, words and word meaning, and graphophonics (letter/sound associations). Teachers can guide students to use cuing strategies by reminding them to ask themselves, "Did it sound right? Did it make sense? Did the word look right?" An English language learner (ELL) is a student who speaks one or more languages other than English and who is just developing proficiency in English. 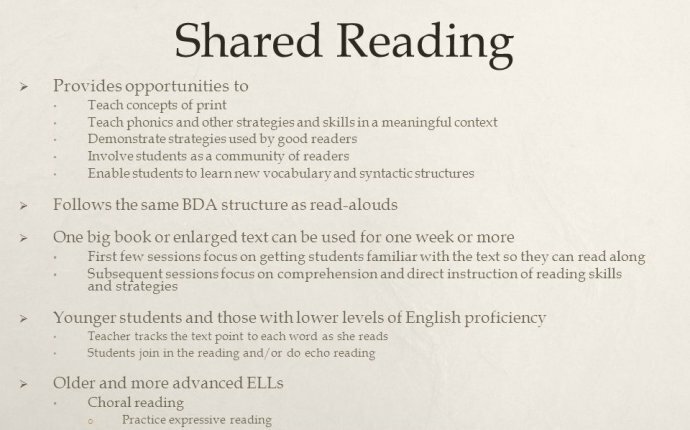 In this video library, both dual language learning and careful scaffolding of literacy experiences in English enhance ELL students' learning of oral and written English. Miscue analysis is a way of closely observing, recording, and analyzing oral reading behaviors to assess how the reader is using specific cuing strategies, like the use of syntax, semantic information, and graphophonics. The teacher uses a specific code to record actual reading. Miscue analysis is usually done with an unfamiliar, long text, followed by a taped retelling. Scoring and analysis is more complex than with a running record, and is usually done at a later time. While running records are most often used with beginning readers, miscue analysis can be used for more advanced readers. Most words and many syllables can be separated into onsets (the initial consonant sound such as /c/ in cat) and rimes or phonograms (the vowel and letters which follow, such as /-at/). Whole words can be separated into onsets and rimes, such as "/f/ /-or/, " as can syllables, such as /"tr/ /-ans/ /f/ /-orm/. Some words and syllables have only rimes, such as "/on/" or "/-ing/".